A locomotive is a railway vehicle that provides the motive power for a train. It has no payload capacity of its own and its sole purpose is to move the train along the tracks. By contrast, some trains have self-propelled, payload-carrying vehicles. These are not normally considered locomotives and may be referred to as multiple units or railcars. The use of these self-propelled vehicles is increasingly common for passenger trains but very rare for freight carriers. Some vehicles, known as power cars, provide motive power to haul an unpowered train but are not generally considered locomotives because they have payload space or are rarely detached from their trains. Traditionally, the locomotive hauls (pulls) the train. In local passenger service, it is increasingly common to see a push-pull operation, where a locomotive pulls the train in one direction and pushes it in the other. The locomotive may be optionally controlled from a cab at the opposite end of the train. The first successful locomotives were built by Cornish inventor Richard Trevithick. In 1804 his unnamed locomotive hauled a train along the tramway of the Penydarren ironworks, near Merthyr Tydfil in Wales. Although the locomotive hauled a train of 10 tons of iron and 70 passengers in five wagons over nine miles, it was too heavy for the cast iron rails used at the time. The locomotive only ran three journeys before it was abandoned. 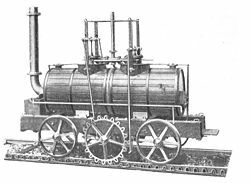 Trevithick built a series of locomotives after the Penydarren experiment, including one which ran at a colliery in Tyneside where it was seen by the young George Stephenson. The first commercially successful steam locomotive was Matthew Murray's rack railway locomotive The Salamanca built for the narrow gauge Middleton Railway in 1812. This was followed in 1813 by the Puffing Billy built by Christopher Blackett and William Hedley for the Wylam Colliery Railway, the first successful locomotive running by adhesion only. Puffing Billy is now on display in the Science Museum in London, the oldest locomotive in existence. In 1814, Stephenson, inspired by the early locomotives of Trevithick and Hedley persuaded the manager of the Killingworth colliery where he worked to allow him to build a steam-powered machine. He built the Blücher, one of the first successful flanged-wheel adhesion locomotives. Stephenson played a pivotal role in the development and widespread adoption of steam locomotives. His designs improved on the work of the pioneers. In 1825 he built the Locomotion for the Stockton and Darlington Railway which became the first public steam railway. In 1829 he built The Rocket which was entered in and won the Rainhill Trials. This success lead to Stephenson establishing his company as the pre-eminent builder of steam locomotives used on railways in the United Kingdom, the United States and much of Europe. Ease of maintenance. It is easier to maintain one locomotive than many self-propelled cars. Safety. It is often safer to locate the train's power systems away from passengers. This was particularly true in the case of steam locomotives, but still has some relevance for other power sources. Easy replacement of motive power. Should the locomotive fail, it is easy to replace it with another. Failure of the motive power unit does not require taking the entire train out of service. Maximum utilisation of power cars. Idle trains waste costly motive power resources. Separate locomotives enable costly motive power assets to be moved around as needed. Flexibility. Large locomotives can be substituted for small locomotives where the grades are steeper and more power is needed. Obsolescence cycles. Separating the motive power from payload-hauling cars enables one to be replaced without affecting the other. At times locomotives have become obsolete when their cars were not, and vice versa. Energy efficiency. Multiple units are more energy efficient than locomotive-hauled trains and more nimble, especially on grades, as much more of the train's weight (sometimes all of it) is placed on driven wheels, rather than suffer the dead weight of unpowered coaches. No need to turn locomotive. Many multiple units have cabs at both ends or are arranged so that a set of cars has cabs at both ends, so that the train may be reversed without uncoupling/re-coupling the locomotive, giving quicker turnaround times, reducing crew costs, and enhancing safety. Reliability. Due to Multiple Unit trains having multiple engines, the failure of one engine does not prevent the train from continuing its journey. A locomotive drawn passenger train typically only has one power unit, meaning the failure of this causes the train to be disabled. However, some locomotive hauled passenger trains may utilize more than one locomotive, as do most locomotive hauled freight trains, and are able to continue at reduced speed after the failure of one locomotive. Safety. Multiple units normally have completely independent braking systems on all cars, meaning the failure of the brakes on one car does not prevent the brakes throughout the train from operating safely. In the nineteenth century the first railway locomotives were powered by steam, usually generated by burning coal. Because steam locomotives included one or more steam engine, they are sometimes referred to as "steam engines." The steam locomotive remained by far the most common type of locomotive until after World War II. The first steam locomotive was built by Richard Trevithick; it first ran on February 21, 1804, although it was some years before steam locomotive design became economically practical.. The first commercial use of a steam locomotive was Salamanca on the narrow gauge Middleton Railway in Leeds in 1812. The locomotive Fairy Queen, built in 1855, runs between New Delhi and Alwar in India and is the longest-running steam locomotive in regular service in the world. The John Bull, built in 1831 and preserved in mostly static display at the Smithsonian Institution in Washington, D.C., is currently the oldest operable steam locomotive. The all-time speed record for steam trains is held by an LNER Class A4 4-6-2 Pacific locomotive of the LNER in the United Kingdom, No. 4468 'Mallard, which pulling six carriages (plus a dynamometer car) reached 126 miles per hour (203 kilometers per hour) on a slight downhill gradient down Stoke Bank on July 3, 1938. Aerodynamic passenger locomotives in Germany attained speeds very close to this, and this is generally believed to be close to the practicable limit for a direct-coupled steam locomotive. Before the middle of the twentieth century, electric and diesel-electric locomotives began replacing steam locomotives. Steam locomotives are less efficient than their more modern diesel and electric counterparts and require much greater manpower to operate and service. 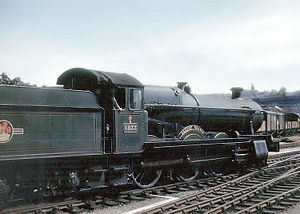 British Rail figures showed the cost of crewing and fuelling a steam locomotive was some two and a half times that of diesel power, and the daily mileage achievable was far lower. As labour costs rose, particularly after the second world war, non-steam technologies became much more cost-efficient. By the end of the 1960s-1970s, most Western countries had completely replaced steam locomotives in passenger service. Freight locomotives generally were replaced later. Other designs, such as locomotives powered by gas turbines, have been experimented with but have seen little use. By the end of the twentieth century, almost the only steam power still in regular use in North America and Western European countries was on heritage railways specifically aimed at tourists and/or railroad enthusiasts, known as "railfans" or train spotters, although some narrow gauge lines in Germany which form part of the public transport system, running on year-round timetables, retain steam for all or part of their motive power. Steam locomotives remained in commercial use in parts of Mexico into the late 1970s. Steam locomotives were in regular use until 2004 in the People's Republic of China, where coal is a much more abundant resource than petroleum for diesel fuel. India switched over from steam-powered trains to electric and diesel-powered trains in the 1980s, except heritage trains. As of 2006 DLM AG (Switzerland) continues to manufacture new steam locomotives. Starting in the 1940s, the diesel-powered locomotive began to displace steam power on North American railroads. Following the end of World War II, diesel power began to appear on railroads in many countries, By the 1960s, few major railroads continued to operate steam locomotive. As is the case with any vehicle powered by an internal combustion engine, diesel locomotives require some type of power transmission system to couple the output of the prime mover to the driving wheels. In the early days of diesel railroad propulsion development, electric, hydrostatic and mechanical power transmission systems were all employed with varying degrees of success. Of the three, electric transmission proved to be most practical, and virtually all modern diesel-powered locomotives are diesel-electric. Diesel locomotives require considerably less maintenance than steam, with a corresponding reduction in the number of personnel needed to keep the fleet in service. The best steam locomotives spent an average of three to five days per month in the roundhouse (shop) for routine maintenance and running repairs. Heavy overhauls were frequent, often involving removal of the boiler from the frame for major repairs. In contrast, a typical diesel locomotive requires no more than eight to ten hours of maintenance per month and may run for many years between heavy overhauls. Diesel units are not as polluting as steam power—modern units produce low levels of exhaust emissions. Diesel locomotives can also be fitted with dynamic brakes that use the traction motors as generators during braking to assist in controlling the speed of a train on a descending grade. A gas turbine-electric locomotive, or GTEL, is a locomotive that uses a gas turbine to drive an electrical generator or alternator. The electric current thus produced is used to power traction motors. 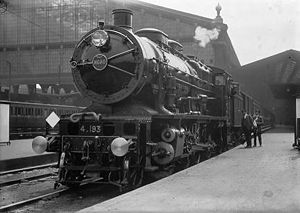 This type of locomotive was first experimented with in 1920 but reached its peak in the 1950s to 1960s. The turbine (similar to a turboshaft engine) drives an output shaft, which drives the alternator via a system of gears. Aside from the unusual prime mover, a GTEL is very similar to a diesel-electric. In fact, the turbines built by General Electric used many of the same parts as their diesels. A turbine offers some advantages over a piston engine. The number of moving parts is much smaller, and the power to weight ratio is much higher. A turbine of a given power output is also physically smaller than an equally powerful piston engine, allowing a locomotive to be very powerful without being inordinately large. However, a turbine's power output and efficiency both drop dramatically with rotational speed, unlike a piston engine, which has a comparatively flat power curve. Gas turbine locomotives are very powerful, but also tend to be very loud. 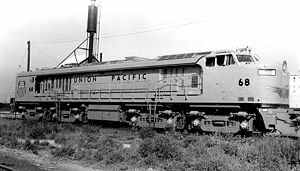 Union Pacific operated the largest fleet of such locomotives of any railroad in the world, and was the only railroad to use them for hauling freight. Most other GTELs have been built for small passenger trains, and only a few have seen any real success in that role. After the 1973 Oil Crisis and the subsequent rise in fuel costs, gas turbine locomotives became uneconomic to operate, and many were taken out of service. This type of locomotive is now rare. 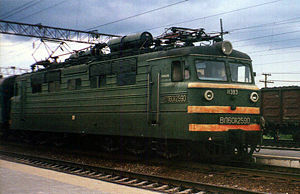 An electric locomotive is supplied externally with electric power, either through an overhead pickup or through a third rail. While the capital cost of electrifying track is high, electric trains and locomotives are capable of higher performance and in some cases lower operational costs than steam or diesel power. The world speed record for a wheeled train was set in February 2007 by a French TGV which reached a speed of 553 kilometers per hour (344 miles per hour). Some electric locomotives can also operate off battery power to enable short journeys or shunting on non-electrified lines or yards. Battery-powered locomotives are used in mines and other underground locations where diesel fumes or smoke would endanger crews, and where external electricity supplies cannot be used due to the danger of sparks igniting flammable gas. Battery locomotives are also used on many underground railways for maintenance operations, as they are required when operating in areas where the electricity supply has been temporarily disconnected. However, the cost and weight of batteries prohibit using battery-powered locomotives on extended runs. The newest technology in trains is magnetic levitation (maglev). These electrically powered trains have an open motor which floats the train above the rail without wheels. This greatly reduces friction. Very few systems are in service and the cost is very high. The experimental Japanese magnetic levitation train JR-Maglev MLX01 has reached a speed of 581 kilometers per hour (361 miles per hour). The Transrapid maglev train connects Shanghai's Pudong International Airport with the city. 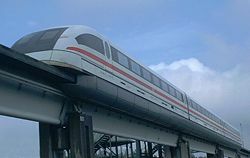 The first commercial maglev trains ran in the 1980s in Birmingham, United Kingdom, providing a low-speed shuttle service between the airport and the railway station. Despite the interest and excitement, the system was shut down due to a lack of spare parts and replaced by wheeled cablecars a few years later. A hybrid locomotive is a Locomotive that uses an on-board rechargeable energy storage system (RESS) and a fuelled power source for propulsion. Hybrid trains typically are powered either by fuel cell technology or the diesel-electric hybrid which reduces fuel consumption through regenerative braking and switching off the hydrocarbon engine when idling or stationary (currently used in automobiles). There are other forms of motive power in experimental use. Parry People Movers makes an experimental light rail railcar powered by energy stored in a flywheel. The flywheel is powered from an onboard battery-driven motor or internal combustion engine and is also recharged through regenerative braking. A proposed alternative is to recharge the flywheel from external electric motors installed at station stops. Although this would increase installation costs it would substantially reduce the weight of the vehicles. It would cost less than providing a continuous electrical supply. Parry People Movers have been tested on several railways, including the Ffestiniog Railway, the Welsh Highland Railway and the Welshpool and Llanfair Light Railway. The first mainstream timetable service for the flywheel railcar was launched in February 2006, providing the Sunday service on the short link between Stourbridge Junction and Stourbridge Town in the United Kingdom. The three main categories of locomotives are often subdivided in their usage in rail transport operations. There are passenger locomotives, freight locomotives and switcher (or shunting) locomotives. These categories mainly describe the locomotive's combination of physical size, starting tractive effort and maximum permitted speed. Freight locomotives are normally designed to deliver high starting tractive effort—needed to start trains that may weigh as much as 15,000 tons—and deliver sustained high power, at the sacrifice of maximum speed. Passenger locomotives develop less starting tractive effort but are able to operate at the high speeds demanded by passenger schedules. 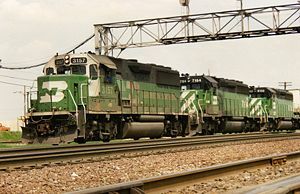 Mixed traffic locomotives (US: general purpose or road switcher locomotives) are built to provide elements of both requirements. They do not develop as much starting tractive effort as a freight unit but are able to haul heavier trains than a passenger engine. Most steam locomotives are reciprocating units, in which the pistons are coupled to the drivers (driving wheels) by means of connecting rods. Therefore, the combination of starting tractive effort and maximum speed is greatly influenced by the diameter of the drivers. Steam locomotives intended for freight service generally have relatively small diameter drivers, whereas passenger models have large diameter drivers (as large as 84 inches in some cases). With diesel-electric and electric locomotives, the gear ratio between the traction motors and axles is what adapts the unit to freight or passenger service, although a passenger unit may include other features, such as head end power (also known as hotel power) or a steam generator. Some locomotives are designed specifically to work mountain railways, and feature extensive additional braking mechanisms and sometimes rack and pinion. Steam locomotives built for steep rack and pinion railways frequently have the boiler tilted relative to the wheels, so that the boiler remains roughly level on steep grades. ↑ 1.0 1.1 Ellis, Hamilton (1968). The Pictorial Encyclopedia of Railways. The Hamlyn Publishing Group, 12. ↑ Ellis, Hamilton (1968). The Pictorial Encyclopedia of Railways. The Hamlyn Publishing Group, 20-22. ↑ Ellis, Hamilton (1968). The Pictorial Encyclopedia of Railways. The Hamlyn Publishing Group, 24-30. ↑ Railway Technical Web Pages. Comparison of locomotive hauled and multiple unit trains. Retrieved April 17, 2007. ↑ Ellis, Hamilton (1968). The Pictorial Encyclopedia of Railways. The Hamlyn Publishing Group, 355. ↑ HistoryWired: A few of our favorite things. John Bull Locomotive. Retrieved April 17, 2007. ↑ Marsden, Richard. The Gresley A4 Pacifics. London & North Eastern Railway (LNER) Encyclopedia. Retrieved April 17, 2007. ↑ Deutsche Bahn Museum. DB-Konzern - 05 001. Retrieved April 17, 2007. ↑ Mike's Railway History. Diesel Locomotives - The way it was in 1935. Retrieved April 17, 2007. ↑ Associated Press. French train breaks speed record. CNN.com (April 4, 2007). Retrieved April 17, 2007. This page was last modified on 24 July 2018, at 18:18.